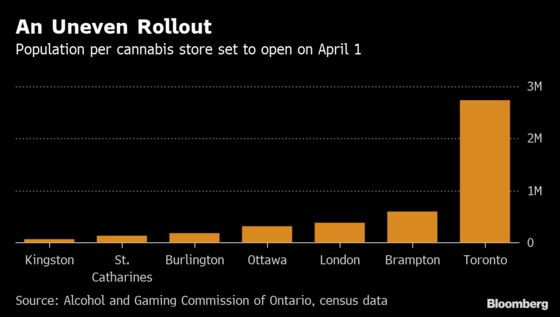 (Bloomberg) -- Canada’s most populous province will finally open its first pot shops Monday, nearly six months after legalization. The initial result will be underwhelming, to say the least. Gawri has hired a public-relations firm to help him manage the media mayhem that’s likely to result from having the only store in a city that’s home to most of the country’s biggest news outlets. Whether customers will be as excited remains to be seen. Ontario residents have been able to buy cannabis legally since Oct. 17 through the government-run Ontario Cannabis Store website, and the black market remains robust due to lower prices and better selection. The illicit market accounted for about 80 percent of the C$5.9 billion ($4.4 billion) Canadians spent on cannabis in the fourth quarter, according to Statistics Canada. Other cities will be better serviced than Toronto at first. Ottawa, the nation’s capital with a population of nearly 1 million, has three stores ready to open on Monday. Kingston, with a population of about 124,000, will have two. Despite the limited rollout, the opening of Ontario stores is “a very significant development” for the industry, Peter Aceto, chief executive officer of CannTrust Holdings Inc., said in an interview. “I think it’s a very important part of getting us out of the black market and I definitely do think it’ll have an impact on demand,” he said. Demand, however, wasn’t the problem for CannTrust and competitor Cronos Group Inc., which both posted significant stock declines last week after reporting sales that missed the lowest analyst estimate. Both failed to capture much of Canada’s recreational market in the fourth quarter, with Cronos’s share estimated by analyst Tamy Chen at BMO Capital Markets at 2 percent and CannTrust’s at 4 percent. However, both also stressed that revenue should improve over the course of 2019 as new growing capacity comes online. While most of the larger Canadian licensed producers stress that Canada will ultimately be a small piece of a much bigger international opportunity, the direction of their stock price is still very much determined by their performance in the Canadian market. Cronos’s stock fell 9.5 percent in the two sessions following its earnings, while CannTrust’s shares plunged 19 percent the day it reported. Those declines weren’t enough to remove Cronos or CannTrust from the S&P/TSX Composite Index’s leaderboard. Cannabis stocks made up six of the top 10 performers on the Canadian benchmark in the first quarter. Hexo Corp. led the way with a gain of 87 percent, followed by Aurora Cannabis Inc., up 78 percent. 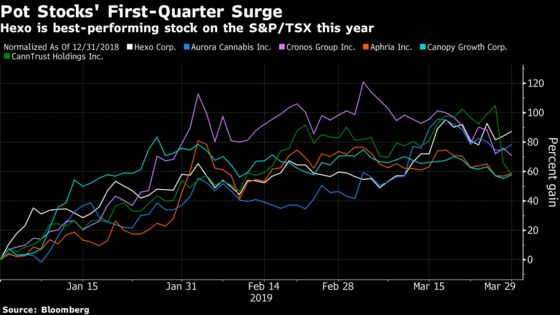 Cronos was in fourth place, Aphria Inc. in sixth, Canopy Growth Corp. in seventh and CannTrust in eighth. Those results helped the benchmark post its best first quarter in 19 years. The cannabis sector as a whole ended the weekly slightly lower, with Bloomberg Intelligence’s Global Cannabis Competitive Peers index falling 1.2 percent. Mixed messages from south of the border weighed on stocks after New Jersey lawmakers scrapped a planned legalization vote due to a lack of support, while the House Financial Services Committee voted in favor of the SAFE Act, which would permit commercial banks to offer services to cannabis companies that are in compliance with state law.